Clearly, you should only be greedy for fundamentally “good” assets, which requires fundamental analysis as the first level of decision-making. However, determining “when others are greedy” and “when others are fearful” is a matter of technical analysis, which is a good companion to fundamental asset selection and allocation. Investors as a whole are most greedy at the top of an up trend, and most fearful at the bottom of a down trend. 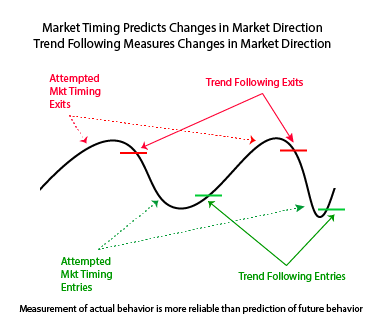 To follow Buffet’s advice, you must choose between predicting the tops and bottoms of cycles (market timing), or measuring that a top or bottom has just occurred (trend following). Trend following is the rational choice in our view. Market Timing is based on unspecified or variable information and opinion inputs – it cannot be defined, automated and back-tested. 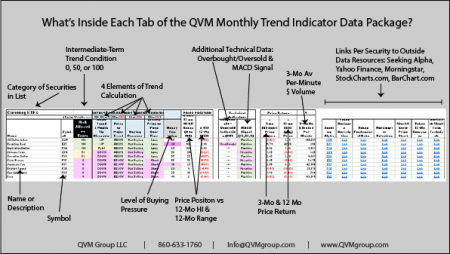 Trend Following is based only on price and volume behavior – it can be defined, automated and back-tested. Market Timing is opinion; subjectively derived about what someone thinks the market ought to do next. Trend Following is factual; objectively derived by observing what the market price and volume have done. The “QVM 4-Factor Trend Indicator” is an intermediate trend following method. It is meant to be a technical companion to fundamental asset selection and allocation. A video explanation of the indicator methodology, including back-testing results with the S&P 500 and precursors from 1904 follows in this video. It is reasonable to be in or overweight those securities in confirmed up trends; and to be out of or underweight those in confirmed down trends. If you are considering certain securities for entry, it is reasonable to enter only in a confirmed up trend. Why enter during a down trend, since you don’t know where the bottom is. If those securities you intend to own are currently in a down trend, it is reasonable to wait for that down trend to change to a confirmed up trend before committing capital. The principle value of trend following in practice is not outperforming in up markets, but rather outperforming in down markets (“winning by not losing”) — having a low capture ratio in down markets and a reasonable capture ratio in up markets. Each month, we measure the intermediate trend status of thousands of listed stocks and ETFs, and over 1400 retail level mutual funds. For February 2017, we measured the trend status for 8,020 securities. 61% of the 6,578 listed securities were in demonstrated up trends. 78% of the 1,442 mutual funds were in demonstrated up trends. While this is a monthly subscription data service, the February data package is available to anyone without charge. 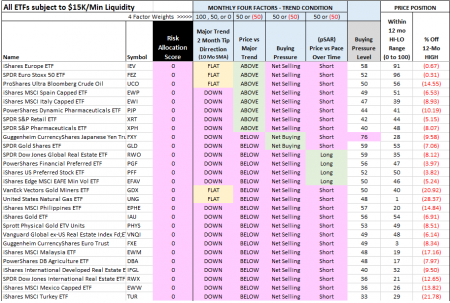 Download the full 2017-02-26 trend data spreadsheet here. This article will show you the current trend status of key securities, but first, here is the structure of what is in the data package. If you would like to inspect your portfolio holdings in terms of their intermediate-term trend condition, download the February data package. The tab for the 1,442 mutual funds most likely has any fund you may own. The tab for all listed securities with sufficient data (about 28 months of existence) will most likely have the vast majority of the listed securities you own. CAUTION: Bond funds are included in the study, but the trend determinations may be less clear for them, as bonds do not tend to change direction as often or as dramatically as equities — and this methodology has not yet been back-tested for bonds. Bond funds are included for completeness, but may not all be appropriate for such analysis. Long-term and low quality bond funds are probably more appropriate for this method of analysis than short-term and high quality bonds funds. 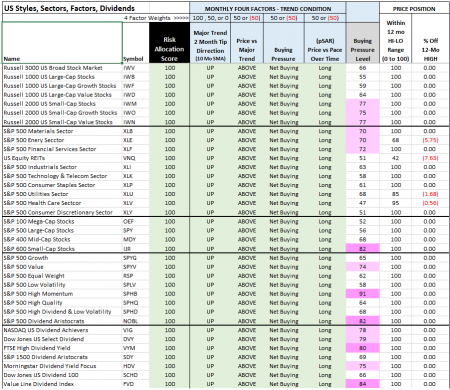 All of the members of this group from Vanguard (the largest purveyor of target date funds) for retirement years 2015 – 2055 are in demonstrated up trends. These and most US asset categories are in up trends. Some are in or near overbought condition as the “Buying Pressure Level” column shows. More are in up trends than down trends. This list is of the country funds in up trends. Interesting to see that Argentina is in the second strongest trend, as measured by Buying Pressure Level. This is the list of country funds in down trends. Mexico is in that group, which may be partially a Trump effect. The other country funds are rated 50 either because they have weak trends, or because they are in transition from one direction to the other. 74% of S&P 100 stocks are in up trends. 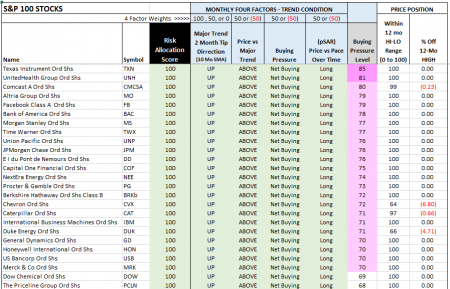 Here are the 25 of those in the strongest up trends. They are mostly all in or near overbought condition. 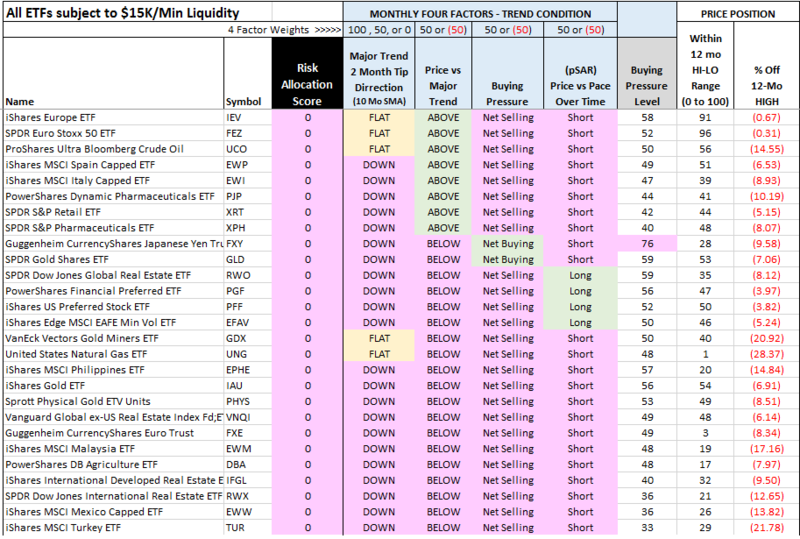 Most liquid ETFs (defined here as trading at least $15,000 per minute) are in up trends or rated 50 for a weak or transitional trend, but here is the complete list of those non-bond, non-levered, liquid ETFs that are in down trends. The David Swensen Portfolio components were referenced in his 2005 book, “Unconventional Success – a Fundamental Approach to Personal Investment”. The allocation he used (as updated in 2015 to 5% more emerging markets and 5% less REITs), was 30% US stocks 15% developed markets ex US stocks, 10% emerging markets stocks, 15% US REITs, 15% intermediate-term US Treasuries, and 15% US Treasury inflation protected securities. He termed it a “reference portfolio” because it is merely a starting point for personalization based on goals, needs, circumstances, and the ability to stick with the portfolio over time. Swensen is the long-time CIO of the Yale endowment. We hope you found this helpful and would be pleased to discuss with you how this methodology could be overlayed on your portfolio. The monthly data subscription is $299 per year.